Founded in 2004 via the evil genius that is Simon Cowell, Il Divo is a supremely talented British-based international pop opera foursome comprised of French pop singer Sébastien Izambard, Spanish baritone Carlos Marín, American tenor David Miller, and Swiss tenor Urs Bühler. Cowell had a desire to bring classical and opera to a commercial audience and spent two years searching for and developing talent for a project that has enjoyed unparalleled international success. Multi-million selling global superstar Michael Ball will be join Il Divo. 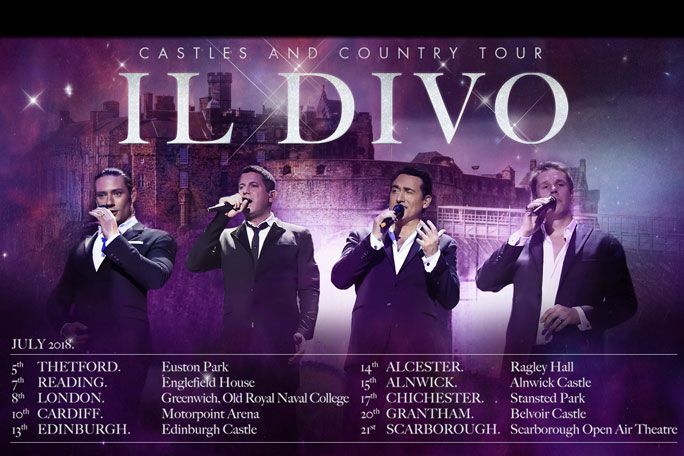 Il Divo: Stratford-upon-Avon is not available to book, please sign up to our newsletter for updates and offers on forthcoming and available shows. Doors open at 5pm. Starts at 7.30pm. Please note: tickets for this show will be sent out 10 days before the event. Please check carefully that the correct venue is selected.